When Mrs Jeanie Lee of New Formosa, calls you for dinner, you should readily accept, simply because, she’s a fantastic cook. And she really does cook the best Taiwanese cuisine in town. I love Taiwanese food – heavy on pork, meat, seafood and vegetables, with an emphasis on textures that may seem odd to some. Soups tend to be clear, but thick and sweet with loads of ingredients and highly nourishing. 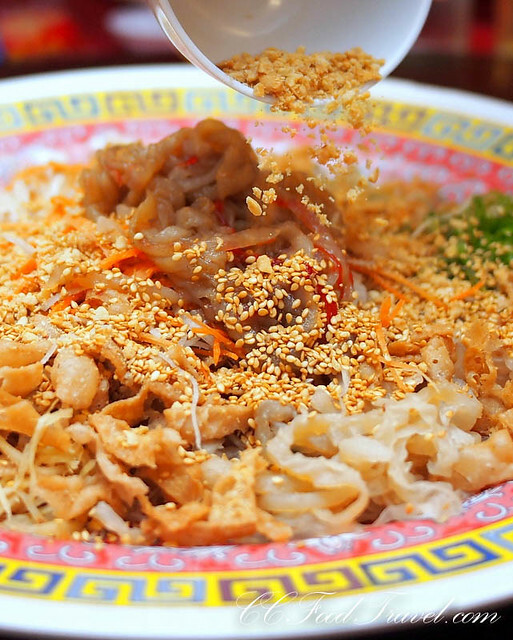 The noodles tend to be a springier analogue to the concept of al dente, and is essential, whether you’re chewing noodles, fish balls or the tapioca in your sweet milky tea. 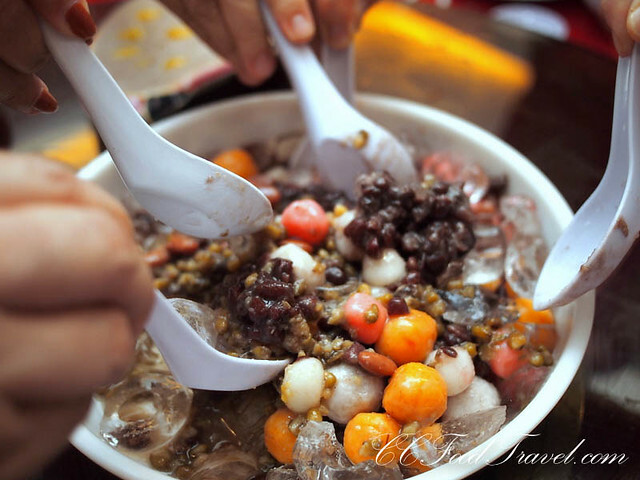 And oh, the colorful yam balls and assorted beans dessert is to die for as well. Apparently the term “three cup” comes from the fact that when you are cooking the mussels, it takes three cups of sauce (soya sauce, sesame oil and Chinese wine) as a base, hence the name, ‘three cup’. These mussels were super succulent and coated in a light, creamy, sweet sauce. The butter eel had a gorgeous curry leaf aroma about it, and as it melted in my mouth, it reminded me of butter prawns. The seaweed rolls were nicely savory and made for a colorful appetizer. 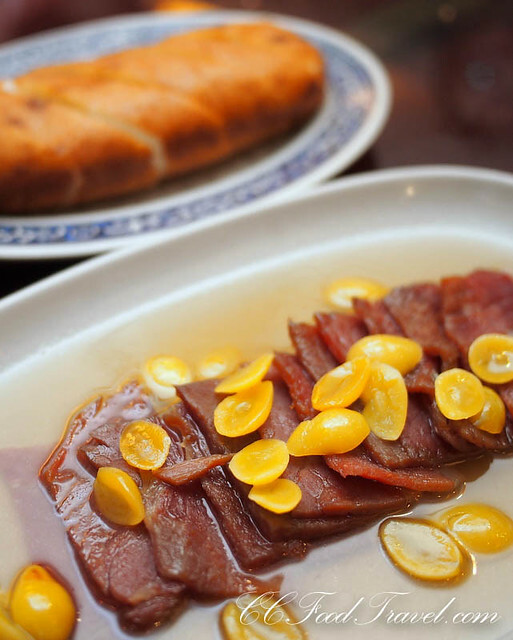 This dish is comes from Hunan, and you will notice a rather sweet ham flavour due to the honey sauce. It goes so well with the gingko nuts and deep fried mantau. Super addictive. 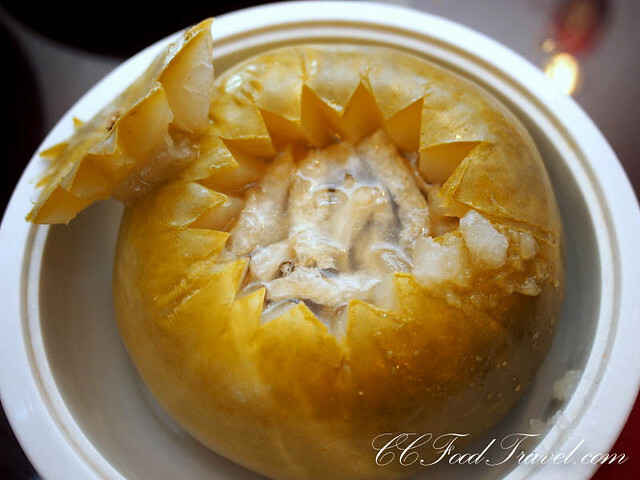 One of my best childhood memories is of Winter Melon soup, that my grandma would make. Commonly used in Chinese cuisine, these impressively sized gourds are mild, slightly sweet, and the perfect ingredient for a clean, restorative soup. 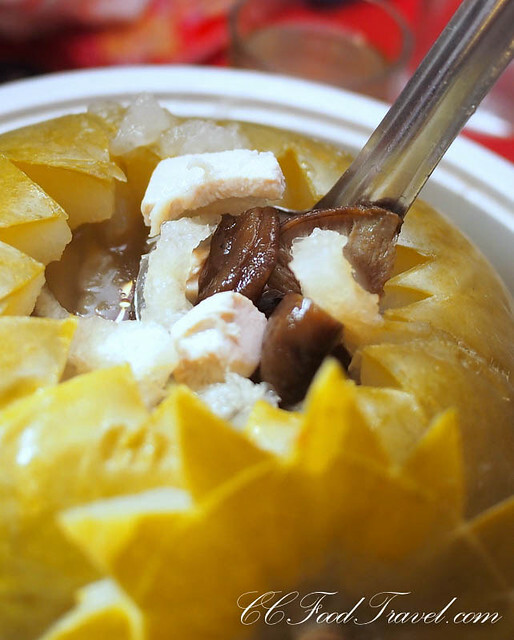 Winter melon soup is traditionally made with pork and consists of a lovely broth of melon simmered until soft and velvety. I especially enjoyed this winter melon soup because it had loads of ingredients in it such as fish maw, mushrooms and meat. To say that New Formosa is famous for its Feng Sha chicken, would be an understatement. Every time I dine here, I must have it. My family members love it too. 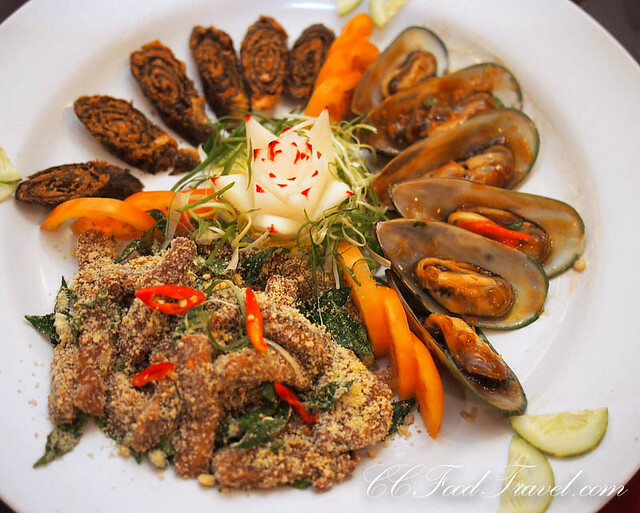 It is called feng-sha or fung-sha (meaning wind sand) chicken, because fried garlic and chopped spring onions cover the meat like a light dusting of sand. 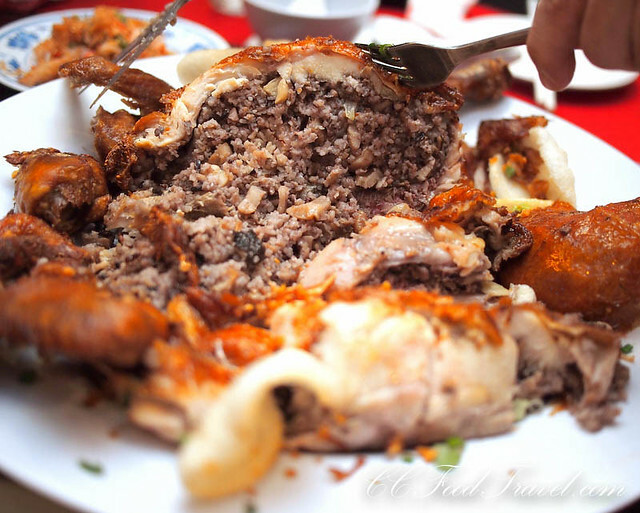 Once you carve up the chicken, the real surprise is inside, where more fried garlic, chopped spring onions, brown rice mixed with finely chopped chestnuts, dried shrimps, herbs and spices make up the stuffings of the chicken. It all tumbles out in a lovely mess, as you reach the center of the chicken. Seriously, once it is carved up, you will understand why it’s called Feng-sha.. it looks like dustings of sand, everywhere! Sounds questionable, but the herb-infused skin is super-crispy and the meat is tender and juicy, not oily. I am totally addicted to this dish – go for the drumstick, you won’t regret it! The star of this dish was the stuffed lotus root. It tasted superb with a nice crunchy texture. 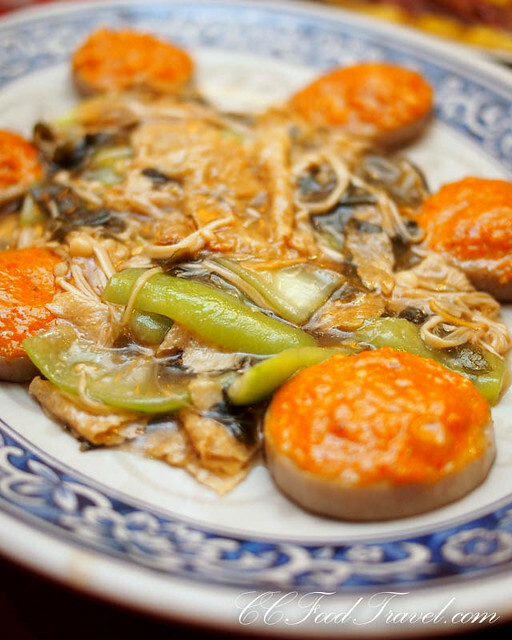 The mushrooms, loofah and seaweed lent a contrasting soft and velvety texture to the lotus root. I think this dish is now a hot favourite of mine. 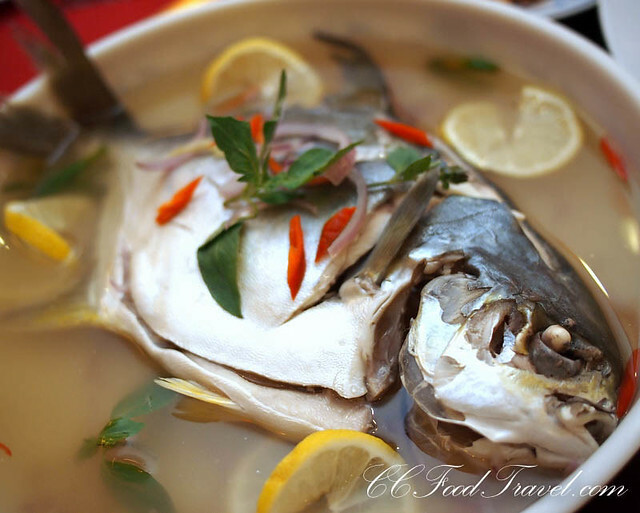 A friend asked me, is this fish dish sweet? The 100 Plus must be a red herring because the fish tastes nothing like 100 Plus. The marinade is actually quiet marvelous, and the fish was slightly spicy, had a tangy sourish flavour that came from the marinade, and the overall permeating aromas of basil leaves, onions, chillies and lemons were hard to top. Pomfret has never been a favourite fish of mine ( I find many restaurants overcook it), but here at New Formosa, it was splendid. A must order. For abundant grace and blessings, toss the Yee Sang real high.. and make a wish with your friends for a blessed new year, filled with fine health, prosperity and good, good things. Dessert of Oh Nee – mashed yam with ginkgo nuts and pumpkin is executed beautifully here with just the right degree of sweetness, and it is not too oily, since vegetable oil is employed, instead of animal fat. 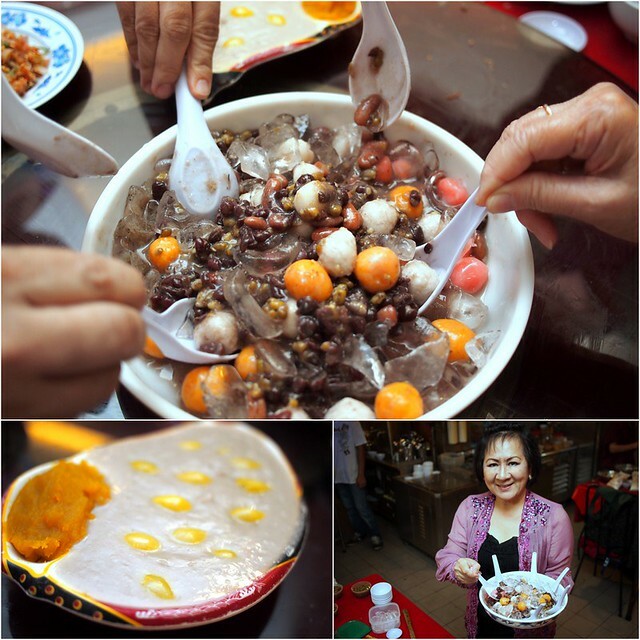 And the colorful Taiwanese food street dessert – jiu-fen which is a famous dessert, of yam balls with assorted beans, concludes dinner. The chicken looks interesting. Well the Oh Nee is a must try dish, it is hard to find good ones nowadays in KL. I love a good Oh Nee! 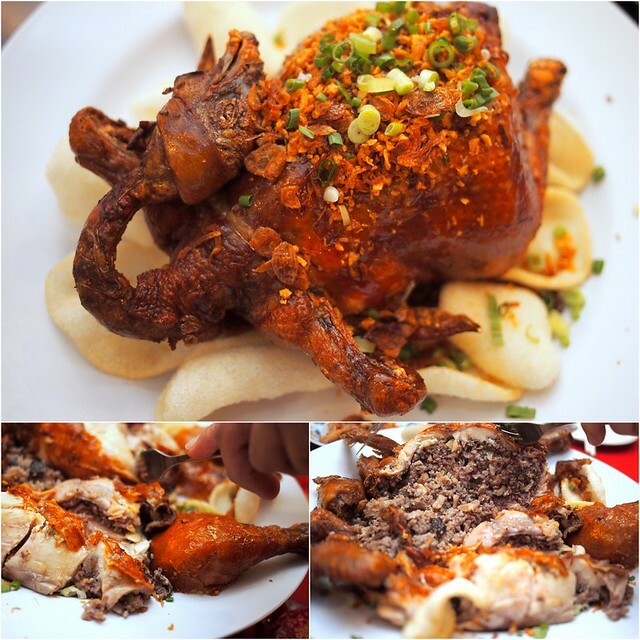 😀 And if you’re into crispy chicken skin like I am, then this chicken is a must order!